It happened on West Fifth Street near Madison Avenue. Covington Police officers found the man suffering multiple stab wounds and he was transported to University of Cincinnati Medical Center. Police later identified the victim as Michael Mincey, 31, a homeless man. He is in stable condition, police said. The suspect was later identified as David Othaniel Watson, 24, who was arrested early Tuesday morning. 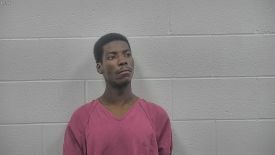 He is lodged in the Kenton County Detention Center where he faces a charge of first degree assault. Watson was arrainged Tuesday morning. The stabbing happened as contractors from Icon Solar were placing solar panels on the roof of information technology firm C-Forward, located on the southwest corner of the intersection. C-Forward employees were also in the parking lot at the time. Employees and contractors tended to the man until emergency responders arrived. The man was apparently stabbed across the street and then ran to the C-Forward parking lot. The case is under investigation and anyone with information is asked to call Covington Police at 859.292.2272. Correction: An earlier version of this story called the solar company First Solar. It is Icon Solar.